You might have missed my Monday „compass“ yesterday. Jetlag killed me on Sunday night, so this week I publish on Tuesday. I hope it was worth the wait. 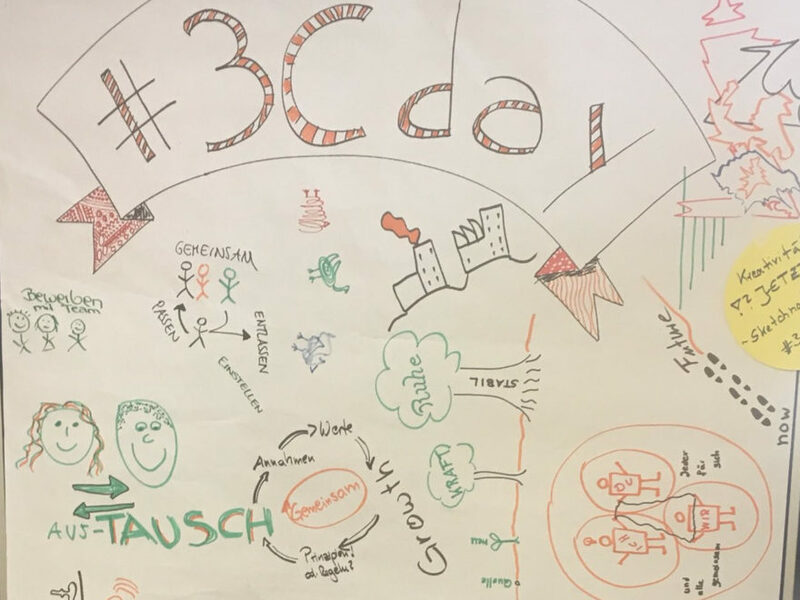 You’ll get a summary of the „CREATIVE COLLABORATION CULTURE DAY“ at Karlshochschule Karlsruhe, a non-profit conference organized by Christoph Thomas. The conference was a mix of presentations and open space. Level 1 – Discrete applications like Email, Office (Word, Excel), CRM (e.g. Salesforce) and ERP (=SAP). Since we don’t have a standard CRM at my company my immediate reaction was that we are below level 1. But we do track customers and in some small niches we are at level 2 or 3. Michael concluded his talk on how to change towards a digital workplace. He showed four pillars of change: Ability to change – Knowhow and Skills, Willingness to change – Must and Want change. We all agreed that we need to focus on people, their fears and demonstrate the benefits a digital workplace offers. Too often we are focused on the tools only. He then walked us through the whole lifecycle of an employee from identification of the need, over recruiting and onboarding to the release (e.g. termination, retirement, move to different org). He claims that if you let the team handle the whole process, you get better results (better fit, more agile, …). I fully subscribe to his arguments and can see it work. I don’t see this happening at many companies soon though. I see too many old beliefs and corporate practices that are barriers to Andreas‘ vision. But the talk was one of these little sparks that glows somewhere in my head. I’m pretty sure it will turn into a fire at some point in time. Just need to find the right starting point. My favorite presentation came from Clemens Thomas, an artist and composer. Clemens started with a little exercise. He asked us to rub our hands. Friction generates heat, which he used as analogy for innovation. Besides friction he showed us nine more ingredients for creativity and innovation. Whether this is taking your time, different perspectives and acceptance of failure. In our daily business we often do the exact opposite. We ask people to deliver results fast. We want people to follow standards and norms. So no wonder that creativity gets lost and innovation is low. Next on stage was Jonathan Funke from Tandemploy. He stood in for his boss Anna Kaiser, who was supposed to give a talk about job sharing the end of the 40 hour work week. Jonathan shared some insights into the Generation Y and Tandemploy. He is very happy in his job and shared the great atmosphere at Tandemploy. Building office furniture together and using a storm as opportunity for a team event are great examples for team building at low/no cost. He gave a few more examples on where he sees examples for #newwork. Still I was disappointed by this talk as I didn’t learn much about success stories of job sharing and where it might not work. Individual responsibility – blessing or curse? Final presenter was Gebhard Borck. While we started the day digital, his presentation was fully analog. He used just sticky notes and a whiteboard to develop his pitch together with the audience. Everybody wants individual responsibility in order to have meaningful work, have fun and be agile. But the organization wants security, results and no failure. So the individual goals can be in conflict with the organization’s goals. Individual goals can lead to a local optimum but we need to strive for the global optimum. In the Q&A Andreas Zeuch stepped in on a question about decision making. He’s going nuts when organizations just practice grassroots democracy. People need to be trained in decision making and need to understand which methodologies to use when. This spoke out of my heart. A blog post on decision making is on my creative backlog! So what was in it for me? I got some actionable ideas I can try out. I got some sparks that might turn into a fire at some point. And I met lots of interesting people beyond speakers that inspired me. Johanna is trying to establish her blog http://www.livinginkarlsruhe.com/, which is also a mix of English and German articles. Check out her blog and stay tuned for her report of #dreiCday. I also met Thomas Michl, whose links of the week I follow for some time already. I think the diverse audience was the biggest plus of this event. Attendees of different ages and nationality came from different industries, university and government. This gave a lot of different perspectives. One of the ingredients for creativity! I hope this overview of the #dreiCday was helpful for you. Let me know if you are interested in more details or would like to exchange ideas on any topic.